The LAME encoder is a command line software which most do not like to use. The GUI used by RazorLame is easy to use even for Windows interfaces. You will note that much like the other software the Razorlame software makes for easy use. Batch processing is also allowed in the software. You will need to choose the files you wish to convert and from there choose you encoding type. That means you will need to decide the bitrate or compression rate and also the end file type. This can be anything from an MP3 to Ogg format. 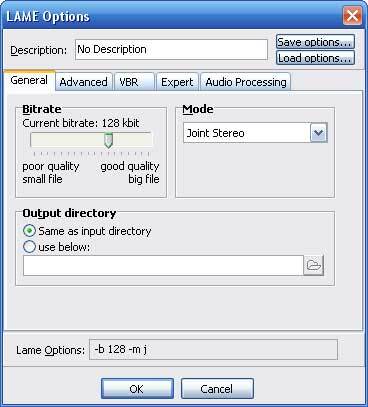 The bitrate can be set in the software from poor quality with a small file size to good quality with a larger file size. You will also not that there is an advanced and a VBR option on the menu. Search this website for more information on LAME and the different options which are available to use with the software. Rememeber you need two pieces of software. The LAME encoder as well as an interface software much like RazorLame or LameXP software.